Downward Dog And Other Poses Get The Thumbs-Up During Pregnancy : Shots - Health News Moms-to-be who practice prenatal yoga say it reduces stress, anxiety and even pain. A study finds that even poses once thought to be off limits to pregnant women are safe. Four pregnant women sit in lotus position. Lots of studies have looked at the health benefits of prenatal yoga for the mother to be. 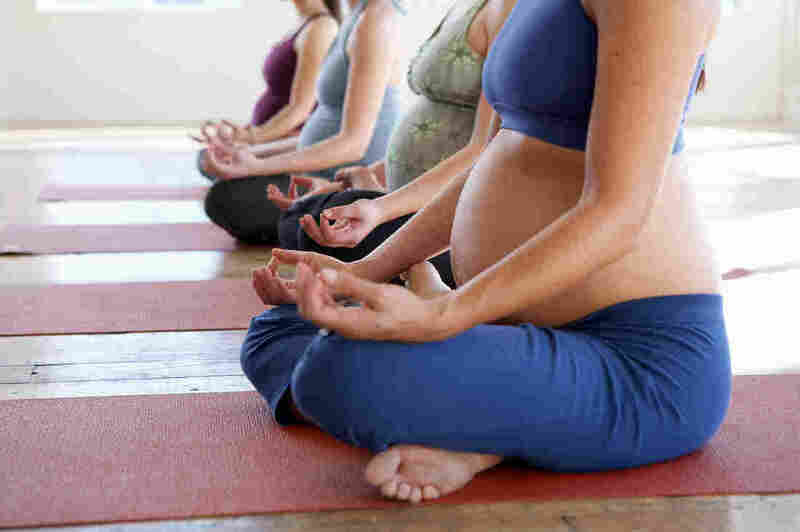 There's even some evidence that yoga can be potentially helpful in reducing complications in high-risk pregnancies. But does yoga have any impact on the fetus? "I wasn't able to find any evidence-based studies" to answer this question, says Dr. Rachael Polis, who practices gynecology at Kosair Children's Hospital in Louisville, Ky. So she and a group of collaborators decided to conduct their own study. Their findings have just been published in the journal Obstetrics & Gynecology. They recruited 25 healthy pregnant women in their third trimesters. All the women in the study had uncomplicated pregnancies; no high blood pressure or gestational diabetes. During one-on-one yoga classes, the women were guided through 26 poses — everything from standing poses, to twisting poses to stretching. "We found these postures were really well-tolerated by women in our study," says Polis, who conducted the research while she was a resident at Jersey Shore University Medical Center. "Women's vital signs, heart rates, blood pressure — these all remained normal." In addition, there were no falls or injuries. And none of the women reported "decreased fetal movement, contractions, leakage or fluid, or vaginal bleeding in the 24-hour follow-up," according to the study manuscript. And very important, the fetal heart rate during all 26 poses remained normal. "Because we had them [the pregnant women] on continuous fetal monitoring, we could see that the fetal heart rate remained normal," says Polis. During the study, the women avoided inversion poses such as handstand or headstand to reduce the risk of falls. And for obvious reasons they also avoided lying flat on their bellies. But they did try poses that some yoga teachers have advised pregnant women to avoid. These include the downward-facing dog; the happy baby pose — that's a pose where you lie on your back and hold your toes like a baby; and the corpse pose, where you lie on your back. Pregnant women are often told to lie on their sides, not their backs, during the final stages of pregnancy. Polis says her study finds all of these four poses were well-tolerated. So, the message here seems to be: Go for it! "This is preliminary information, but I think it's exciting and reassuring to know there were no adverse changes for both mom or baby," Polis says. There is one caveat. Polis says it's important that every woman check with her ob/gyn to make sure that there are no complications before hitting the yoga mat.